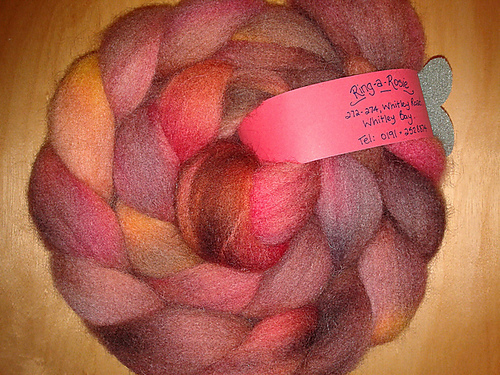 I’d picked up this fibre at Ring-a-Rosies in Whitley Bay back in November – I just loved the colourway. But I wasn’t sure what to do with it. Then the new Knitty came out (Winter bis 2012) and with it, the new Wanderlust pattern which suggested handspun as an excellent option for the pattern. So while I didn’t have enough fibre for full-size mittens I certainly had enough for an abbreviated versions. This was my first time spinning singles, which I know I overspun, but careful management when winding and knitting ensured that the overspun sections were corrected. I got a slightly variegated weight yarn but the majority came out as worsted. Tags: drop-spindle, shetland, spin, spinning | Permalink.